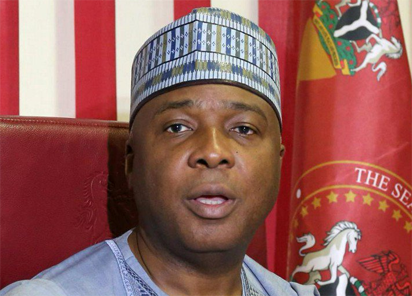 Abuja – Senate Bukola Saraki will address a World Press Conference at the foyer of the National Assembly at noon on Wednesday, says Mr Yusuph Olaniyonu, his Special Adviser on Media and Publicity. Olaniyonu did not indicate issues to be addressed at the conference in a statement he made available to newsmen in Abuja on Tuesday. However, it is expected that the blockade of the NASS by the security operatives and the postponement of the emergency meeting of principal officers of both chambers might feature in his address. Saraki had on Monday convened the emergency meeting for Tuesday but the NASS blockade by security operatives forced it to be postponed indefinitely. In a joint statement by Saraki and Speaker, House of Representatives Yakubu Dogara, they said that the unpleasant development at the assembly complex accounted for the postponement “until further notice’’. “Following this unpleasant development, the joint leadership meeting slated for this afternoon has been postponed till further notice because it cannot hold under the prevailing circumstances. “The heavy presence of armed security men who unnecessarily militarised the legislative complex and harassed legislators and workers in the complex could not be justified in a democracy.